Trulia has teamed up with the popular mobile app Uber to make it easier for buyers to dart over to listings that strike their fancy. The arrangement appears to be a win-win for Trulia, allowing the listing portal to earn referral fees from Uber — an app that lets users hail drivers from a smartphone — while providing additional value to prospective buyers. “Uber is an innovative company that’s now empowering our users to take the next step, from viewing homes online to touring in person,” said Jonathan McNulty, head of consumer product at Trulia, in a statement that appeared in a blog post Uber published on the integration. As part of the integration, Trulia now features a link to uber.com on every listing page available on its mobile website. Users can tap the link to quickly pull up Uber’s mobile app and digitally order a driver. ‘Visit with Uber’ links (shown in the bottom right-hand corner of the image above) now appear on Trulia listing pages. The links to uber.com, which are generated through Uber’s API (application programming interface), do not appear inside Trulia’s mobile app or on its desktop website. 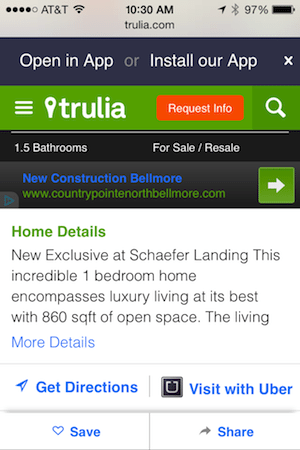 Only users who visit Trulia from an Internet browser on a mobile device see the links to Uber. The integration might help buyers — assuming they have the cash to spare — overcome the challenge of finding listings in foreign neighborhoods with limited parking. “Potential homeowners will no longer have to worry about parking when they visit each home, and it provides each homeowner with another transportation option, where transportation may not be as accessible,” Uber said in its blog post. Drivers ordered through on-demand driver services Uber, Lyft and Sidecar are generally cheaper than traditional taxis, according to a study by What’s The Fare, a website that lets users compare prices between driving services. Uber users set a pickup location by tapping a map display that shows the locations of nearby drivers, and later pay for their ride through the app. Trulia’s collaboration with Uber comes amid a flowering of apps that let buyers request immediate showings from real estate agents, such as Curb Call and AgentPair. Gregg Larson, CEO of Clareity Consulting, has speculated that such apps could spur some Uber drivers to get real estate licenses. Trulia’s integration with Uber would only seem to strengthen that incentive. Trulia embedded links to Uber by tapping the app’s API. That API is public (other users include Starbucks and travel website TripAdvisor), raising the possibility that other listing portals might build similar functionality into their user experiences. Matt Flegal, a spokesman for Trulia, confirmed that Trulia is earning referral fees for business it generates for Uber through its use of Uber’s API, but said he couldn’t share further details. On its developer’s website, Uber advertises the potential for companies that use its API to earn rewards for generating business for Uber. Trulia’s decision to collaborate with Uber over Lyft, Uber’s chief rival, might puzzle some industry observers, given that Lyft’s chief marketing officer is a Trulia alum. One reason might be that Lyft hasn’t unveiled a public API yet.